Located on a gorgeous 15th Century property in Tuscany, Italy – Villa Mangiacane is a magnificant villa atop a cypress shaded hill. This luxury villa is only 7 miles south of the Renaissance city of Florence. In addition, it’s just a short, 25 minute drive from the Florence International Airport. Villa Mangiacane can be found in the heart of Chianti Classico, a well known winemaking region in Italy. Being centrally located in Tuscany, feel free to explore the surrounding area. Included is Florence, San Gimignano, plus the awesome city of Siena. The luxurious villa was originally built for the Machiavelli family. The design has many unique characterisitcs of Michelangelo, the iconic artist from the influential, Renaissance period. 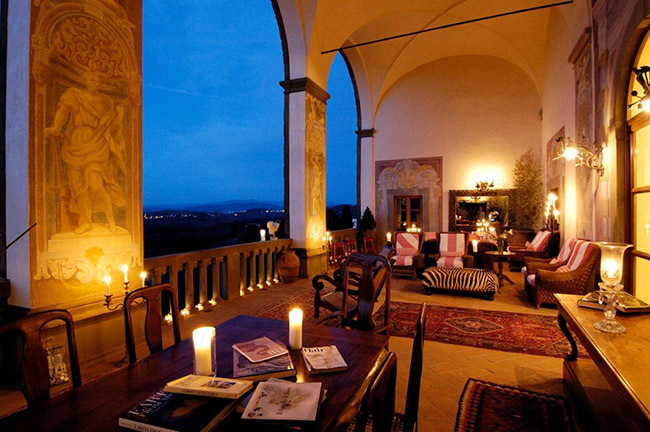 As a result, Villa Mangiacane is the finest, luxury boutique resort and winery in Tuscany, Italy. As a guest, you will enjoy a VIP expereince and receive a five-star luxury accommodation. The property features twenty-eight individually designed rooms and suites. Each is simply stunning. The villa’s proprty encompasses about 600 acres of lush vineyards, as well as olive groves. This private estate produces a wide array of award winning wines. In addition, it produces vin santo and grappa, plus a distinctive olive oil. Stroll along the numerous footpaths and take in the site’s vines and about 6,000 olive trees. You are just a five-minute walk to the nearby Machiavelli museum at Albergaccio. This villa is the perfect destination for a luxury vacation or to celebrate a special occassion. It’s ideal for a honeymoon, anniversary or simply a romantic weekend getaway. Therefore, it should also be considered for any private event. From a corporate meeting, cocktail party, to a wedding or photo shoot, Villa Mangiacane is the perfect venue to host a VIP event. Back in 2001, the villas’s owners began a multi-million-dollar renovation. The project occurred with guidance from Gianclaudio Papasogli Tacca, a Florentine architect. plus Ralf Krall, an international interior decorator. The end result is spectacular! The 28 guest rooms in the estate are filled with original artwork and furniture that has been collected from around the world. Not overbearing, the interior design emulates the comfort of a private home. Hence, you get the feeling of experiencing the best of old-world hospitality, at every turn. The rooms are split between two different properties. All rooms provide awesome views of Florence, gardens or vineyards and the nearby rolling hills. Durng your stay in the main Palazzo Machiavelli, you’ll be surrounded with original Renaissance art. The villa’s numerous terraces offering provide grand vistas of the adjacent Tuscan landscape. For those staying at the exclusive Villa Mazzei, estate guests can enjoy beautiful views of the amazing infinity pool and bar. Plus gaze at the emaculate gardens and scenic views across Chianti. Foodies will be treated to fine dining options like no other. Therefore, villa guests can choose from many dining options. Enjoy a private meal in the seclusion of your own room with in-room service. For a full feast dining experience, eat in the Estate’s gourmet restaurant. In the morning, try an outdoors fresh breakfast and take in the Tuscan countryside. Maybe for lunch, dine by the pool and enjoy a refreshing light lunch around the pool. For dinner, dine in the elegant restaurant. Or for someting a bit lighter, go al fresco in the relaxing Herb Garden. The property also provides a private dinner option in the Barricaia, Wine Cellar. A true intimate experience awaits. In addition, enjoy a meal at The Chef’s Table, offered inside the historic villa kitchen. One needs to get out and explore all Tuscany has to offer. The onsite staff is very attentive and always available to help arrange a selection of exciting excursions. Consider city tours, half or full day wine tours, art and culture excursions and shopping tours. For those who want to try adventure, partake in a various outdoor activities, such as hiking, biking or even a hot air balloon ride! After a fun day exploring, unwind and get pampered at the relaxing Garden Spa. Choose fraom a selection of luxury spa services. Guests at Villa Mangiacane will experience the best life has to offer. Feel like royalty and take in authentic Tuscan hospitality. You will take back home a memorable VIP expereince. The joy of modern day convenience, seamlessly combined with the splendor of the Renaissance etched away forever. The Life of Luxury can assist with all your vacation or private event plans at Villa Mangiacane. Please come back soon and follow our luxury blog. We love sharing the best news in the luxury travel industry. ← Largest Fleet of Rolls-Royce Ghost Motor Cars Anywhere!